The first keynote presentation for the 2019 UKIVA Machine Vision Conference and Exhibition has been announced. With Simultaneous Localisation and Mapping (SLAM) gaining traction in the world of industrial vision, UKIVA is delighted to welcome Dr Luca Benedetti from Kudan, whose keynote is entitled: ‘Visual SLAM in the wild’. Benedetti will describe the real-world challenges of deploying a SLAM system across a variety of applications, as well as designing a SLAM system that’s versatile both in terms of hardware and software. Kudan (www.kudan.io) is a pioneer in the field of artificial perception technology. While artificial intelligence is becoming the brain for machines, it only consists of functionality for learning semantic extraction. Kudan is accelerating the evolution of virtuality (AR/MR/VR) and robotics (automobile/drone/robot) by developing computer software algorithms classified as artificial perception (AP). Kudan’s AP algorithms are the machine equivalent of human eyes. With the combination of AP and AI, machines are getting closer to sensing and interacting with the world like humans, using both eyes and brain. Kudan has been developing SLAM algorithms that can be deployed on a variety of different products that use different sensors, such as drones, robots, vehicles, and mobile devices. SLAM refers to the process of determining the position and orientation (localisation) of a sensor with respect to its surroundings, as well as simultaneously building a map of the surrounding environment. Over the years, various SLAM algorithms have been developed to solve this problem (at least approximately), which typically use either a combination of a camera and a depth sensor, or two cameras together (stereovision) embedded on the device. Most modern SLAM systems used today are based on vision, thanks to the inherent richness of the image data. Vision in robotics has been added to the conference programme as a seminar theme. This reflects the opportunities for robots, cobots and vision as part of Industry 4.0, especially as communication standards such as the OPC UA companion specifications for robotics and machine vision are now emerging. To complement the vision in robotics theme, experts from our sister organisation, the British Automation and Robot Association (BARA), will be available throughout the day. They will be happy to discuss all aspects of integrating robots and vision to improve the automation of processes. These specialists can be found on the BARA stand, which will feature a working robot cell, put together for the event by specialists at the Manufacturing Technology Centre (MTC). After the event, the robot cell will be put on permanent display at MTC’s headquarters in Ansty Park, Coventry, UK. Acrovision will show collaborative robots and vision working together. The company’s cobots are low cost, high precision machines. Cobots no longer need expensive safety guarding, and are used for tasks like pick-and-place, quality inspection, and process tasks. Integrating cobots into vision applications provides a safe and cost-effective solution in many instances, where product handling is an issue or prohibitively expensive. Acrovision will give examples of robot-related 2D and 3D vision applications. In its seminar, Allied Vision will give an overview of the machine vision and embedded vision worlds, and what differentiates them. With the rise of powerful single board computers and system on modules, machine vision and embedded vision are moving closer together. Even though the pure processing power of embedded systems still falls behind traditional PC-based systems, they often employ dedicated hardware to accelerate certain tasks directly on the board. The seminar will discuss the different approaches on the camera level, and address the challenges of future systems and what they will look like. Balluff will be showing its smart camera, which combines the power of the Halcon function library with the simplicity of the BVS-Cockpit user interface. The camera has IO-Link master connectivity in addition to Ethernet/IP, Profinet, TCP and UDP communication. The camera can be accessed from web browsers by using a serial number, and process controls such as brightness, focus or status indication can be set as desired. Balluff offers a full line of accessories including optics, lighting, displays, mounting hardware and power supplies, along with a wide range of IO-Link products which can be directly controlled by the smart camera. ClearView Imaging will be demonstrating 3D cameras and 3D vision systems based on structured light, stereo vision and laser triangulation. Deep learning will also be a key focus, with live demonstrations showcasing Matrox Imaging’s latest classification tool, in addition to Flir’s Firefly camera with on-board deep learning inference. To embrace the Industry 4.0 era, Allan Anderson from ClearView Imaging will give a presentation exploring how machine vision systems can be used in addition with big data to create a far more powerful system. Cognex will showcase its deep learning-based image analysis software designed specifically for factory automation: VisionPro ViDi. It is a field-tested, optimised and reliable software solution based on a set of algorithms in machine learning. Combining artificial intelligence with VisionPro and Cognex Designer software, VisionPro ViDi solves complex applications that are too difficult to programme and maintain using traditional machine vision systems. Edmund Optics will show its range of imaging lenses. One special product on display will be the Techspec liquid lens M12 imaging lens. 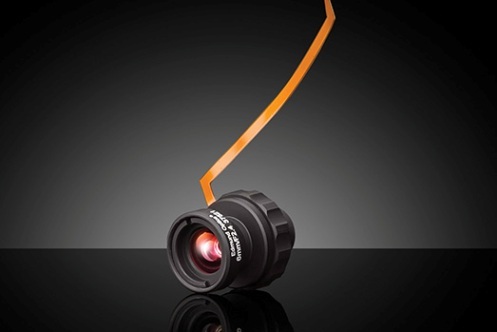 The M12 imaging lenses combine small size and high resolution with the flexibility of a liquid lens, making them ideal for high-speed machine vision applications. The lenses feature an f/2.4 optical design with an integrated liquid lens for high throughput with fast electronic focus. Flir will show its Firefly camera, which combines essential machine vision features with the power of deep learning. Its small size and low power are ideal for portable devices, and it provides excellent imaging with the latest global shutter CMOS sensors. It also integrates an Intel Movidius Myriad 2 vision processing unit to deploy trained neural networks directly onto the camera, and conduct inference on the edge. Flir will also give a presentation on using deep learning and neural networks. Gardasoft will be showing its family of high-speed lighting controllers. The FP220 family provides sub-microsecond current control, with pulsing rates of up to 100kHz for demanding, high-speed applications. 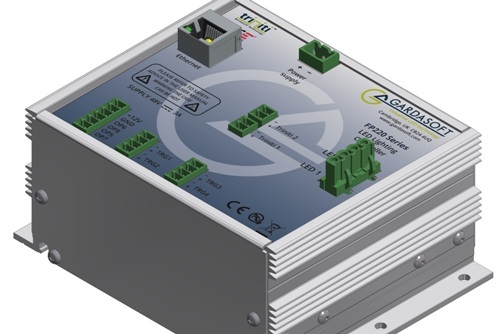 The FP220 series has been designed to be used in high-power, high-brightness systems, and the controllers are capable of delivering long pulses at high power for applications such as UV curing. The controllers can operate at very high frequencies for short pulsing applications such as flow visualisation using particle image velocimetry. At the conference, Gardasoft's Jools Hudson will speak about solving common machine vision lighting challenges. GeT Cameras will show the USB2, USB3, GigE and OEM cameras from Daheng Imaging. The main attractions will be a USB3 Vision camera running on a Raspberry Pi 3, and the board-level USB3 camera VEN-134-90U3M-D that can be equipped with three Python 1300 1.3 megapixel global shutter sensors. The new Mars series camera with Sony’s latest 12 megapixel global shutter sensor, the IMX304, will also be on display. It is available with USB3 and GigE interfaces. Regarding optics, the company will show its new line of C-mount machine vision lenses that go up to 1.1-inch with 20 megapixel resolution. IDS will be showing the new IDS NXT Rio and Rome families of intelligent cameras, and the Ensenso XR series of stereo 3D cameras. The company will also be making two technical presentations at the conference, on vision-guided robot picking applications, and the potential of cameras with on-board processing to reduce the need for large volume data transfer. 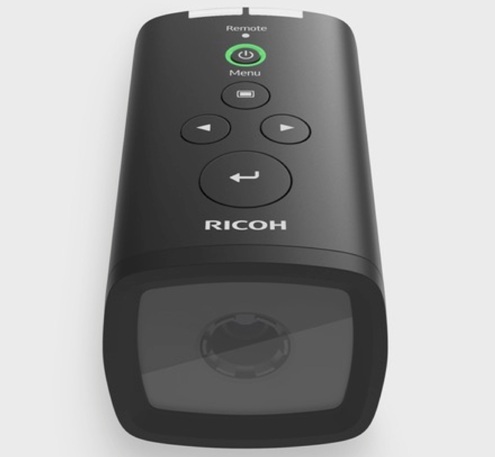 The Rio and Rome cameras can be used as high performance standard industrial cameras, or users can take advantage of extended applications based on vision apps and on-camera neural networks. Pre-trained artificial neural networks of different architectures can be loaded directly onto the cameras to solve AI vision tasks with inference times of only a few milliseconds. The Ensenso XR 3D cameras feature on-board processing for calculating 3D point clouds, with data transmission via Ethernet or WiFi. This gives faster 3D point cloud generation, less strain on network bandwidth and a reduced computing load on the host PC. This allows faster clock rates for applications such as bin picking. Ifm Electronic will display its 3D sensor, designed for automated depalletising systems. The 3D sensor gauges a package’s size and position for robot handling. The 3D sensor detects displaced loads and compensates for incorrect positioning of packages. Position indication allows fully automated depalletising of complete layers or individual packages, independent of the palletising pattern. The camera will also detect slip-sheets between layers. Besides the data for robot control, the Ethernet process interface provides information for the material and warehouse management software. The Ifm system automatically calibrates robot and camera coordinates, so setting it up is easy. 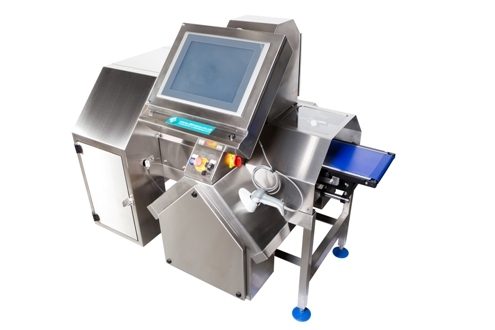 Industrial Vision Systems (IVS) will showcase its IVS-RICi robot inspection cell. The machine is a quality control system using the latest machine vision algorithms for precise inspection in the medical device, pharmaceutical, automotive and component supply industries. The dual IVS-NCGi-1920 high-resolution sensors provide complete coverage even for hard-to-access parts. IVS-RICi inspects with precision on multiple sides and internals of all products including: full engine inspection; chassis conformance checks; dimensional verification over large products; and pallet and tray inspection. IVS autofocus technology gives a variety of focus depths and fields of view. IVS-RICi is easy to program; it can also work side by side with a human operator by using the collaborative robot systems. 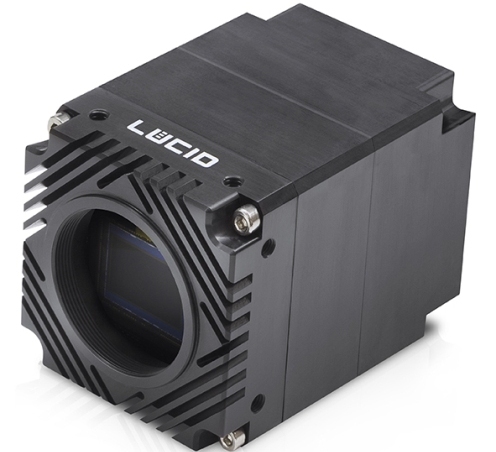 JAI will display its three-CMOS industrial camera Sweep+ SW-4000T-10GE with GigE Vision interface. This prism-based colour line scan camera offers a maximum resolution of 4,096 pixels per line, and in combination with the 10GBase-T Ethernet interface, it can provide RGB output at a maximum line rate as high as 97kHz. The camera offers backwards compatible to NBase-T (5Gb/s and 2.5Gb/s) and 1000Base-T (1Gb/s) making is suitable for the lowest to the fastest running line scan application. Also on display will be a range of three-CMOS colour RGB area scan cameras in the Apex Series (AP-3200T-USB-LS and AP-1600T-USB-LS) with 3.2-megapixel and 1.6-megapixel resolution respectively. These cameras are dedicated to microscopy applications in life science with special demand on colour accuracy. JAI will also show a trilinear colour camera in the Sweep series and polarised cameras in the Go series featuring the Sony IMX250MZR CMOS polarised sensor. Jenton Dimaco will exhibit its latest label verification innovations. The company will demonstrate the use of its technology mounted inside an off-the-shelf thermal transfer printer, commonly found in the food processing industry. In addition, it will show the latest versions of its Veri-Pack and Veri-Central software and back office database systems. Keyence will showcase its multi-spectrum lighting product. 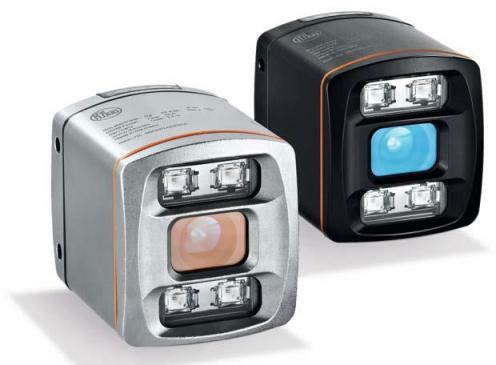 The all-in-one illumination unit provides stable inspection solutions even in environments with significant variation in product and lighting. Through the use of a high-speed monochrome camera in combination with eight-wavelength lighting, multi-spectrum illumination provides powerful colour discrimination capabilities. This enables both easy configuration and stable operation, allowing users to achieve accurate sorting based on even the slightest differences in appearance. Included in the multi-spectrum solution, visitors will also be able to see Keyence’s LumiTrax illumination technology, where analysis is performed using multiple images taken with lighting from different directions in order to remove glare and enhance product features. Matrix Vision will present camera models with Sony Pregius sensors up to 31 megapixels for Gigabit Ethernet, Dual Gigabit Ethernet and USB 3.0. Also on display will be the two-in-one smart camera MvBlueGemini. This camera includes basic functions and therefore end users and system integrators are able to solve applications without programming. Finally, the company will introduce the standalone PC version of the MvImpact Configuration Studio, the software core of the MvBlueGemini. Micro-Epsilon UK will introduce its new 3D surface inspection system for defect detection and for inspecting the aesthetic appearance of non-reflecting (matt, unpainted, plastic and bare metal) surfaces. 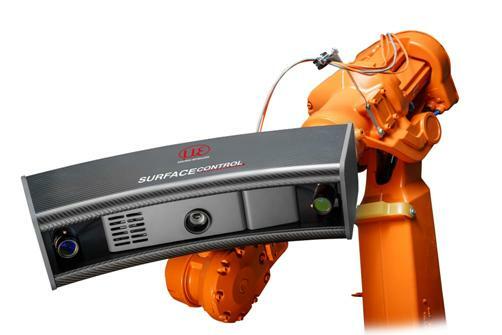 The SurfaceControl system gives fast, reliable 100 per cent surface inspection and can be integrated directly into processing or assembly lines, or on robots. The system is based on the principles of deflectometry and fringe projection, which means even small surface defects, such as scratches, dents and bumps, can to be recognised. It also can give information on surface aesthetics, such as form, shape and waviness. The system is able to detect and quantify the dimensions of surface defects, even to single microns, in an inline industrial environment. 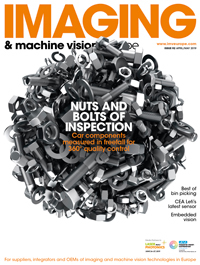 Its measurement capability and ease of integration for both offline and inline environments, has opened up new opportunities for automated visual inspection, which is not possible with current industrial 3D vision technology. Applications are being solved in the aerospace and automotive industries, medical parts production, domestic appliances, consumer electronics and hand held devices. The sensor, which is based on the fringe projection principle, scans the surface and generates a 3D point cloud. It is designed to inspect diffuse surfaces, such as metallic surfaces, plastic surfaces and ceramics. Omron will be showing the new FHV7-series smart camera, combining illumination and image processing for advanced vision inspection. The camera contains a multi-colour light and a 12-megapixel sensor. The smart camera is ideal for installation on production lines manufacturing a variety of customised products, being able to inspect items in different colours and sizes. Photoneo will exhibit its MotionCam-3D camera, which won the 2018 Vision award at the Vision trade fair in Stuttgart, Germany. CTO, Tomas Kovacovsky, will give a presentation about the area-based 3D camera, designed for sensing in rapid motion and at high accuracy. Easy and cost-effective automation is the theme of the RARUK Automation display at this year’s conference. The company will be showcasing two systems based on the UR E-series of collaborative robots. Three Robotiq innovations are included on the first URe demonstration. The Robotiq vision system is designed to work with UR and is easy to set up and integrate, and the new Robotiq Hand-E gripper. This product is the first UR+ certified electric gripper ready for the E-series. High accuracy combined with a 50mm parallel stroke makes it perfect for precision assembly tasks. 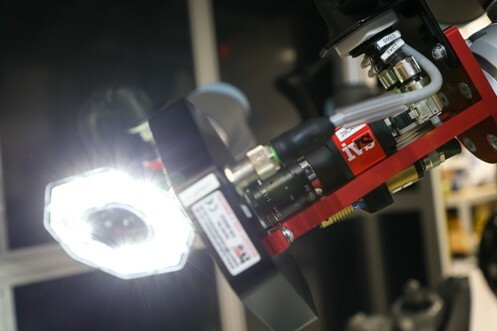 Also new is the Robotiq Force Copilot, which has sensing functions designed to increase flexibility and reliability in machine-tending, assembly, finishing and pick-and-place applications. A suite of set-up tools allows the user to hand-guide the robot on complex trajectories. The software makes it easy to place objects precisely in jigs, trays and chucks, and facilitates assembly applications through alignment, indexing and insertion functions. The second RARUK Automation UR E-series demonstration features the latest addition from Pick-it. This is an M-HD high definition 3D camera for detecting small and medium sized objects, whatever their material of manufacture. Pick-it allows any camera-supported automation application to be built without expert help. 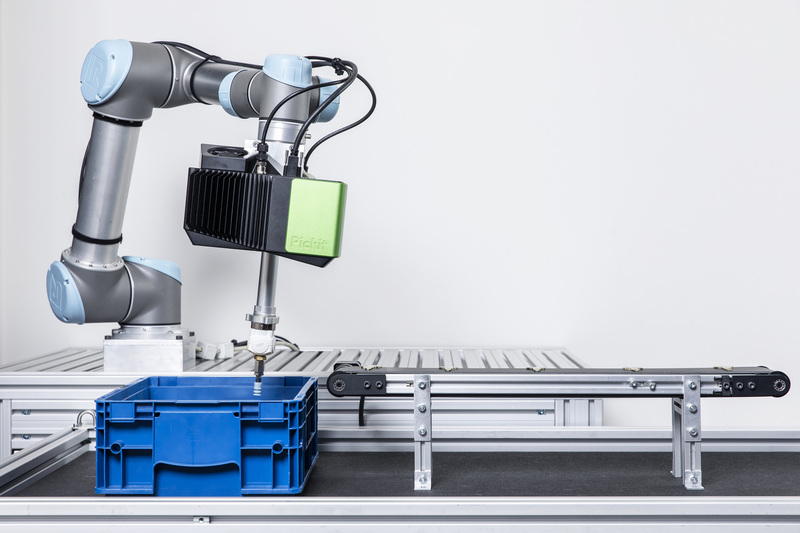 Pick-it guides the robot to see, pick and place products from bins, boxes, pallets and tables onto a CNC machine, assembly line, conveyor belt, welding station or work bench. Sick will show the 4Sight automated print inspection system, developed in Sick AppSpace with packaging automation specialists Autocoding Systems. 4Sight communicates directly with common printer types, such as inject and laser thermal transfer. It can therefore recognise and inspect the alphanumeric code applied by the printer and continue the inspection whenever a code is updated, for example with a new date or batch number. There is no requirement to teach the camera what to look for, or for fixturing using edges or logos. The solution is hosted on the Sick Inspector P vision sensor. The company will also demonstrate its entry-level robot guidance solutions using smart 2D and 3D vision sensors. 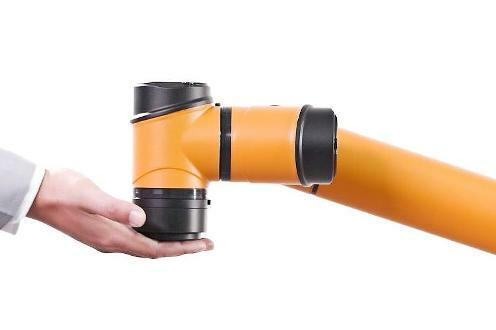 The Inspector PIM60 URCap integrates Sick’s Inspector PIM60 2D vision sensors with Universal Robots. Simple to set up and use, the combination delivers a powerful toolkit for creating a vision-guided robot task with minimum time and effort. Configuration is achieved in minutes through the UR controller or the Inspector PIM60 without need for an additional PC. Finally, Sick’s Trispector P Beltpick is a 3D vision guidance solution for robot picking with improved z-axis control, enabling gentle handling of complex shapes and profiles, or picking products with variable heights from a conveyor. The system adapts the robot’s picking action to the height of each individual product, reducing the risk of damage. With plug-and-play support for ABB, Staubli and Universal Robots, users have access to a range of Sick AppSpace apps for belt picking applications. Other robot manufacturers can also be integrated with the new system. Smart Vision Lights will exhibit its SmartVisionLink technology, which includes wireless remote control of lighting products. 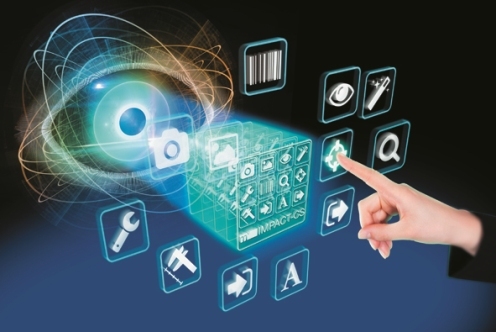 Secure remote access and control of inspection systems is becoming more important for automated material handling and logistics applications, and many other manufacturing systems. Problems such as adjusting the intensity of the blue channel on a multispectral light, or removing a hot spot in a web inspection system because of overlapping lights, can be solved easily during setup and in production using the SmartVisionLink app and SmartVisionLink-enabled lights. Stemmer Imaging will be showing the Ricoh SC-10 human assist camera, the CIS CoaXPress colour line scan bar, and other cameras at the UKIVA exhibition. Visitors will be also be able to see an extensive range of products from many of Stemmer Imaging’s key suppliers who are also exhibiting, including Intel RealSense, LMI Technologies, JAI, Gardasoft Vision, Smart Vision Lights, Teledyne Dalsa, Sony, and Allied Vision. At the conference, Dr Jon Vickers will discuss the use of embedded vision systems. He will define the terms used in the technique, discuss the advantages, and show where embedded systems can work. He will also review situations where they aren’t always appropriate, especially where there is no advantage, and when they are more difficult and more expensive to implement than a traditional system. Sualab will exhibit Suakit, its deep learning machine vision inspection software. It provides a fast, accurate and user-friendly deep learning solution for inspecting defects on production lines. Suakit is suitable for image analysis in fields in which it has traditionally been difficult to inspect using conventional machine vision technologies – in certain applications Suakit is more accurate and faster than conventional automated inspection methods. TPL Vision will show its Ebar Curve high-power bar light, which reduces saturation in the centre of a camera’s field of view. The light balances brightness and homogeneity, allowing smaller bar lights to be used for cost and space saving. 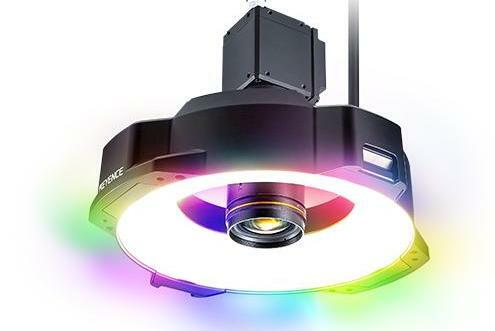 Also on display will be a modular ring light, an all-in-one solution for machine vision and code reading systems. 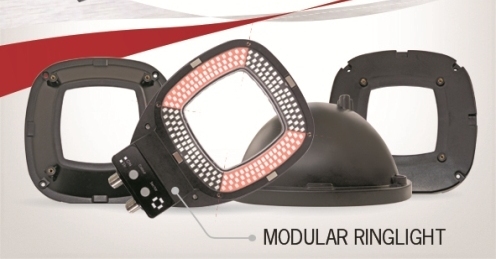 With two ring sizes, multiple colours and embedded features such as sector control, overdrive strobing functions, and reflector attachments, the user can create ring, dome, low angle and darkfield illuminations with just a few part numbers, greatly simplifying the illumination selection process. 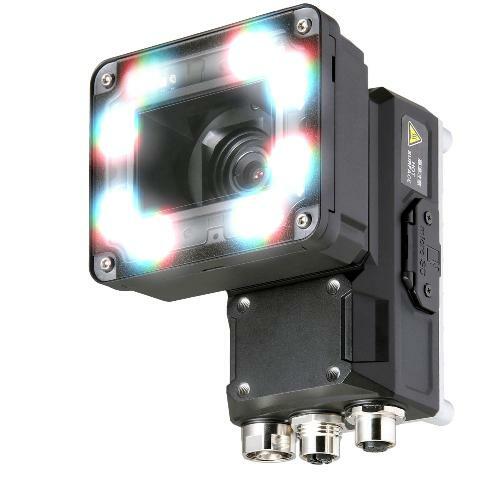 Vieworks will present its latest time delay integration (TDI) line scan cameras. Seven new cameras will be shown, with resolutions of 9k, 12k, 16k and 18k, and Camera Link and CoaXPress interfaces. The cameras reach a speed of 250kHz line rate and offer up to 64 stages. Based on hybrid sensor technology from Vieworks, the new models will offer improved performance and affordability. 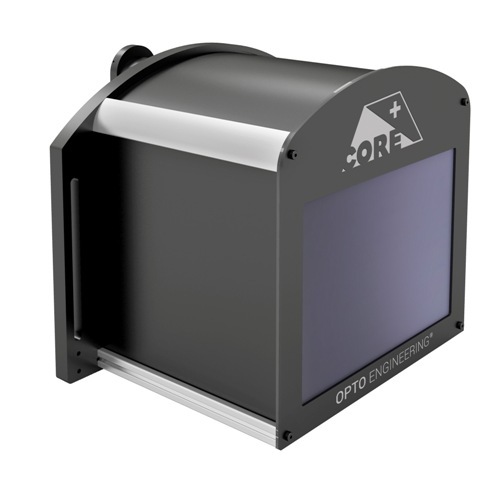 The sensors combine CCD and CMOS imaging technologies and integrate the best features from both. The underling CMOS structure of the sensors enables high-speed readout, eliminates the need for expensive and complex external circuitry, and lowers the power consumption. By incorporating the CCD pixel array on top, the sensor keeps superior image quality from CCD in terms of signal-to-noise ratio and dynamic range. Additionally, the integration process of a TDI camera does not add any noise because it involves the charge transfer. Vieworks will be giving a presentation on its multi-spectral line scan camera based on hybrid TDI technology.